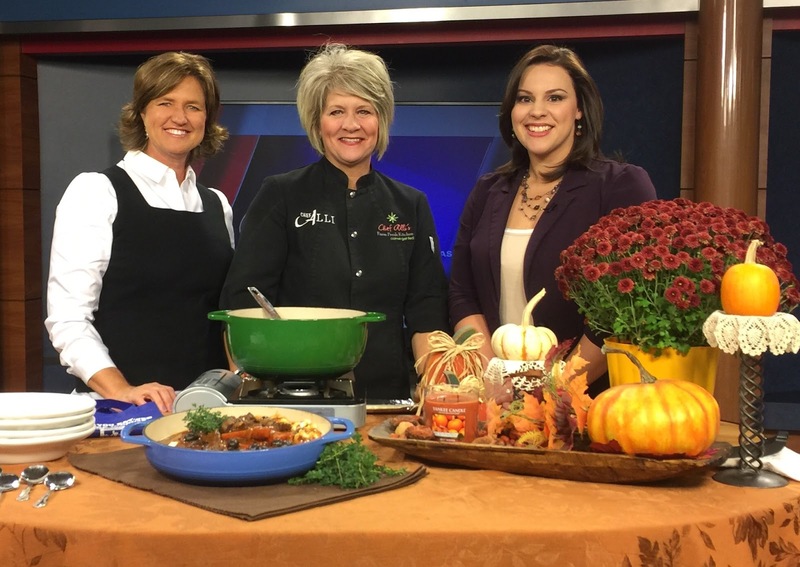 The following is a guest post from my friend Chef Alli of Chef Alli's Farm Fresh Kitchen. She is a fellow farm mom who has a deep love for her family and their farm, and she shows it through her delicious homemade recipes. 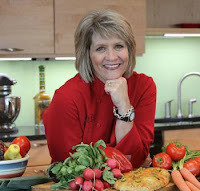 I have used a number of her recipes for my family and they are definitely big hits! This one will be the next recipe I try. A few weeks ago, Alli asked if I could come to Topeka to shoot a Thankful4Ag segment for WIBW-TV. Of course, when a trusted friend asks, I say yes! The focus is two-fold. 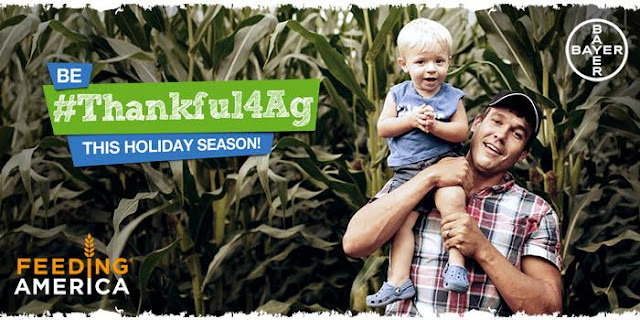 First they are thanking the farmers for growing healthy, safe food. But, more importantly, they are focused on the fact that in America 1 in 7 people are food insecure. Yes, Seriously! In AMERICA! So if you go to the site Thankful4Ag.com and fill out the quiz, you will find out what kind of a farmer you were meant to be and if you share that information online, Bayer CropScience will donate 11 meals to Feeding America! So go take the quiz now and share the information online! Chef Alli: When I first tried this recipe, I had no idea how deliciously, unbelievably, creamy the potato puree would be. After all, aren’t good mashed potatoes pretty creamy if you make them right? That said, you better get your food processor out right now because you are never going to believe how fabulous the potato puree texture is until you try them for yourself. I was completely shocked at the difference between the two and have craved these potatoes on a daily basis ever since! If you make this stew and don’t try the potato puree, you’re doing yourself a complete and total disservice. Don’t do it – try the dang potato puree! Place the beef into a large container or freezer bag; add wine, onion, garlic, orange zest, carrots, thyme sprigs, and bay leaves. Let beef marinate for 18-24 hours. Remove beef from marinade and pat dry with paper towels, reserving the marinade. Liberally season beef with kosher salt and freshly ground black pepper, to taste. In a large Dutch oven, heat olive oil over medium high heat; when oil is hot, add meat, a few pieces at a time, browning off on all sides, working in batches. Remove browned meat to a plate as you go, keeping it warm. Once all the beef is browned and removed, deglaze the pan by adding a bit of wine or broth to the pan, bringing up all the browned bits that are attached to the bottom as you stir. Add tomato paste and olives to the pan at this time and cook, over low heat, until tomato paste has turned from a bright, deep red to a nice brownish color, adding broth or wine as you go so that the tomato paste doesn’t stick to the bottom of the pan too much. 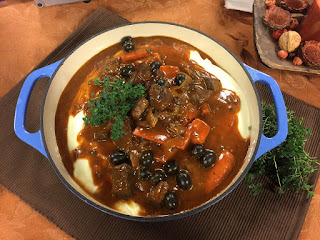 Pour the reserved marinade and it’s ingredients into the Dutch oven, along with the reserved stew meat, to the browned tomato paste and olives, stirring to combine; bring stew to a nice boil, skimming away any foam that comes to the top. Reduce heat until stew is barely simmering, then add broth and cook, partially covered over low heat, for 2-3 hours. Stew may need to be thickened slightly with a little cornstarch slurry before serving. Serve stew over Creamy Garlic Potato Puree. Bring a large pot of salted water to a boil; add potatoes and cook until potatoes are very fork-tender. Meanwhile, in a small sauce pan over low heat, warm cream and garlic to a low simmer, then remove from heat. Drain potatoes well and place them into the bowl of a large food processor; add a bit of the warm cream and garlic and process potatoes, pulsing until very smooth, working in batches if needed. Season to taste with kosher salt and freshly ground black pepper. Serve potato puree as a bed for Rustic Beef Stew. We love stew too! And the sauce for this is absolutely awesome. My buddy Chef Alli says the key is to brown the tomato paste--really! Do it!